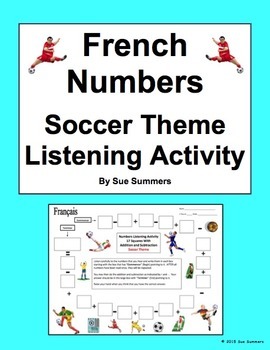 French Numbers and Math Listening Activity Soccer Theme - This French numbers listening activity will hold the attention of your students as they make their way around the oval writing the French numbers that you dictate. After all numbers are dictated, students quickly do the math to find the correct final answer based on the numbers that they heard and wrote. They will be anxious to raise their hands and share their results! You choose the numbers for the activity so it can be used for very basic numbers or large numbers, depending on what your focus is. The download includes an instruction page. 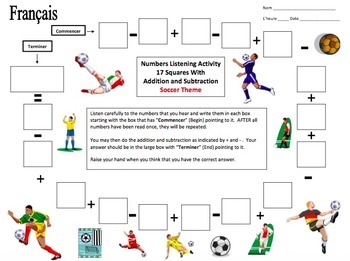 Please click here to see more of my French materials. Please click here to visit my store. •	Look for the green star next to my picture and click it to become a follower. You will now receive email updates about my store.